AUDUSD is massively affected by Australian economic reports such as Australia Current Account, Australia Private Sector Credit (MoM), Building Approvals (MoM) and Building Approvals (YoY). AUDUSD has been moving with bearish bias within the descendant channel and considering the Fibonacci retracement it is so soon to consider this short term growth as a reversal pattern. 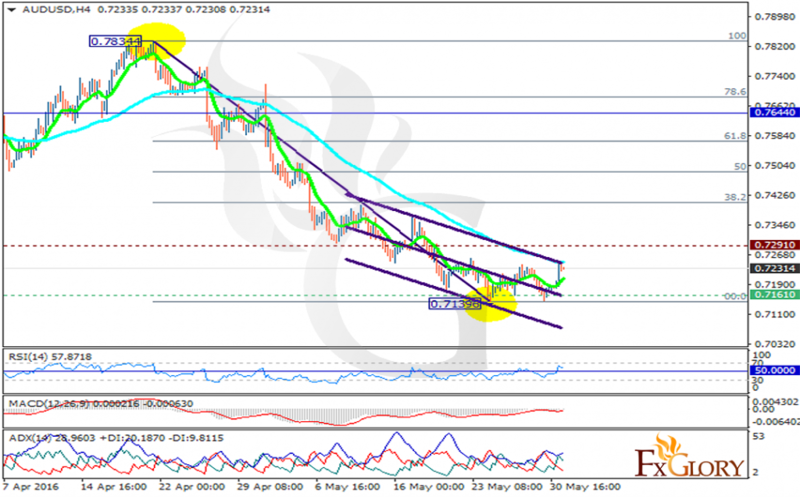 Now the support lies at 0.71610 with resistance at 0.72910 which both lines are below the monthly pivot point at 0.7644. The EMA of 10 is located below the EMA of 75 confirming the recent bearish moves. The RSI and ADX are showing price growth while the MACD is in negative territory signaling the price fall. Traders can give themselves a rest a wait for a better chart setup to trade.